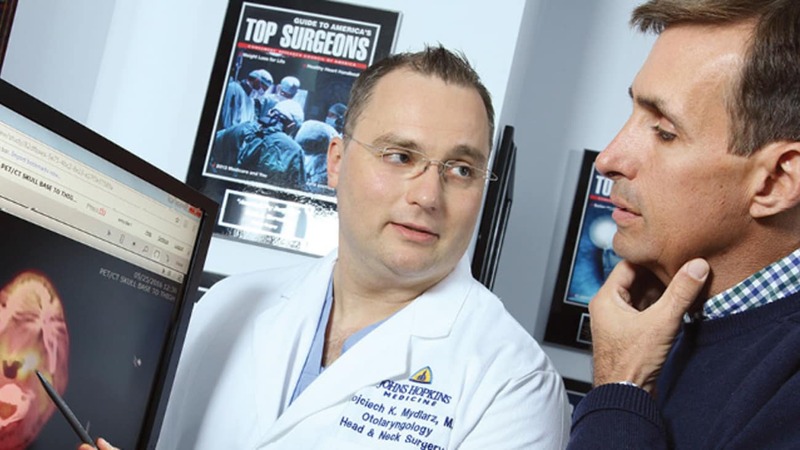 Wotjek Mydlarz discusses case with patient Matt Harcourt, who was diagnosed with squamous cell carcinoma and was treated by Johns Hopkins multidisciplinary experts near his home in Bethesda, Maryland. In January 2016, a routine physical revealed a swollen lymph node on the left side of Matt Harcourt’s neck. Although the 46-year-old father of three had no symptoms, a biopsy by a local ear, nose and throat specialist near his home in Bethesda led to a diagnosis of squamous cell carcinoma of the oropharynx, or head and neck cancer. When he reached out to his friends for advice, they suggested seeing someone affiliated with Johns Hopkins Medicine. His first appointment was with Wojtek Mydlarz, a Johns Hopkins head and neck surgeon who practices at Suburban Hospital in Bethesda. On the same day, Harcourt also saw Brandi Page, a radiation oncologist who specializes in head and neck cancer at the Johns Hopkins Kimmel Cancer Center radiation oncology practice in Bethesda. Nicholas Farrell, a medical oncologist in private practice in Bethesda, was also on the treatment team. Mydlarz suspected that Harcourt’s cancer originated in his left tonsil, a hypothesis confirmed by a physical exam and biopsy. A PET scan revealed that the cancer had spread to some of the lymph nodes in Harcourt’s neck, making it less likely that surgical treatment would be curative without the addition of radiation and chemotherapy. Mydlarz shared the case at head and neck tumor board conferences at Suburban Hospital and The Johns Hopkins Hospital, where team members discuss complicated cases. “Every head and neck cancer patient benefits from the expertise of all the Johns Hopkins specialists, whether they receive treatment locally or in Baltimore,” Mydlarz explains.